• Treadwheel Crane A 350-year-old hoist attached to big wooden hut containing a wheel operated by men walking round inside. Now there's a modern welfare idea, eh Minister? • Electric Theatre Opened in 1911, closed in the 1950s and restored in the 1980s, this is one of the oldest operational cinemas in England. Its facade is glorious, and its daily film programme appropriately not-quite mainstream. • Ha'penny Pier At the tip of the town, overlooking the river, this is a stumpy dog-leg jetty with a cafe and a tiny tourist information hut (where the Harwich Society will hope to sell you some of their many publications). That's a lot more than most small towns have to offer. 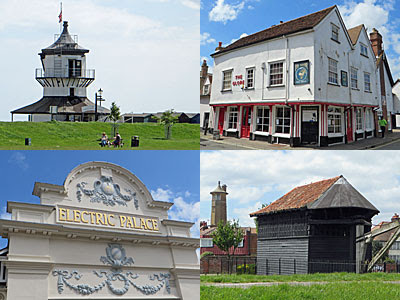 And if Harwich doesn't hold you, here are three neighbouring places to escape to. Dovercourt: Harwich's Essex twin is a former seaside resort fractionally down the coast, now coalesced with its northern neighbour. Its long bay is dominated by two wooden lighthouses, one by the promenade and one out to sea, installed by Trinity House in 1863, again to guide in sailors through careful alignment. It's also a great place for watersports, hence the bay was thronging with windsurfers at the weekend, watched over by spouses and family while they circuited offshore. The council's attempt at a cliff garden seems somewhat worse for wear these days, with crumbling concrete and no attempt at planting, and the beach huts are a motley bunch (numbered in an entirely illogical order). A couple of hotels survive overlooking the breakers, but alas you're too late to visit Dovercourt Bay Holiday Park, once dressed up as Maplins for the filming of Hi-De-Hi, now demolished and replaced by a housing estate. Shotley: At the end of a tongue-shaped peninsula, sandwiched between the Stour and Orwell estuaries, lies the small village of Shotley. It's most famous as the site of the Royal Navy's training school for boys, based on the Navy's last sailing ship, with recruits numbering 500 before WW1 but 2000 after WW2. The boys lived and trained in a complex on the hill, now almost entirely demolished and awaiting rebirth as housing, but the mast of HMS Ganges (which they used for rigging practice) remains on site. Various artefacts from the naval colony are preserved in a museum by the marina, free to enter, and containing the ship's original figurehead. Or, while you're waiting for the ferry to come back, you can go for a walk up one or other arms of the estuary. The Stour side is prettier, with a strip of communal woodland atop the cliffs, an important bird habitat along Erwarton Bay, and fine views over the peninsula from the adjacent farmland tracks. Meanwhile the Orwell side is busier, with yachts aplenty off the salt marsh, and the amazing sight of the Port of Felixstowe on the opposite bank. I couldn't take my camera off the miles of cranes and containers, so beguiling is the import/export theatre played out on the Suffolk shore. I counted 34 cranes in total, their automatic shuffling servicing a sequence of giant international ships piled high with wares from abroad. 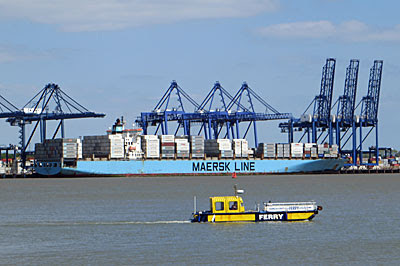 A lot of what you buy comes through here, out of mind and out of sight, unless you live in Harwich or Shotley, that is. Felixstowe: And the ferry also runs from Harwich to Felixstowe, which I suspect is a busier run, but that's for another day.